Ignition Coils – Coils ain't Coils! 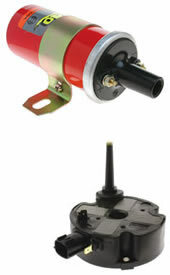 In the past, a weak spark resulting from a suspect ignition coil just required the fitting of a standard single ignition coil to suit a point’s ignition or an electronic ignition system. The task was simple and took only minutes to perform with the results evident instantly. Due to the constant development of the modern motor vehicle and strict emission regulation demands put on the manufacturers, ignition systems had to change and change they did! A popular development was the now out dated but still plentiful fully electronic distributor with internal ignition coils that produced a huge output and required little servicing. Even though this type of ignition coil can be prone to failure, in many cases it may be incorrectly diagnosed and unnecessarily renewed, mistaken for cap and rotor faults. Many manufacturers turned to coil packs for a means of ignition and many utilised the waste spark system, where one coil is used for two cylinders. It is important to note that the coil output requirement is much greater for the cylinder at the c ompression cycle compared to the cylinder at the exhaust cycle which requires very little output. This system may be controlled/triggered directly by the ECU or may be triggered by an external module, either way these systems still utilise high tension leads. A modified expansion of the waste spark coil pack system is still currently used.The use of an inline coil pack, generally controlled/triggered by the ECU with spark outlets located on each spark plug and no longer requiring High Tension (HT) leads. It is important to note that this system still utilises one coil for every two cylinders. A variation to the inline waste spark coil pack configuration currently used, is the in line coil over plug pack which utilises one coil for each cylinder and is timed / triggered by the ECU as required with no waste spark. Both the inline coil pack systems in many cases look similar but vary in their test procedures. A simple identifiable difference is the number of terminal pins at the connector plug. i.e. the waste spark configuration would require fewer pins than the coil per cylinder type. Both system assemblies would require replacement if one of the individual coils fail for any reason. Another ignition coil system that has been used over a period of time, but still remains one of the common currently used systems is the individual coil over plug, which is a variation to the inline coil pack. Being individual allows for replacement of one or more units as required. Most current coil over plug systems are timed / triggered by the ECU in the engines firing order sequence and may integrate electronics for the coil operation or utilise the ECU to operate the coil directly. This variation is common to the inline coil packs as well. It does not matter which configuration is utilised in any vehicle, at the end of the day the coil has a task to perform and that is to fully ignite an air / fuel mixture. If there is insufficient spark to ignite the mixture, it must affect vehicle performance and emission levels (generally under load). Note, that many a suspect ignition coil has been bench tested and found to be satisfactory, only to find when re-fitted to the vehicle it lacks output and affects performance. It is important to realise that testing an ignition coil / assembly on the bench is not the same as when fitted to the vehicle. i.e. The vehicle supply voltages and switching triggers may not be the same or precise as the bench test equipment. Generally a bluish output spark jumping a 10 – 20mm air gap would indicate a suitable output for a current commonly used ignition coil/s during an “on the vehicle test”. A weak orange output spark is unsatisfactory and further tests would have to be carried out. 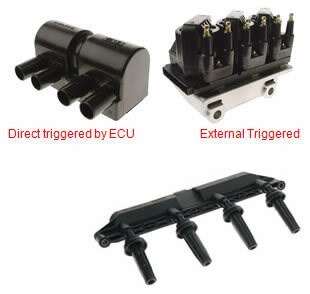 This does not test any other circuits that may be integrated in some ignition coils. Some vehicles incorporate a feedback circuit signal from the ignition coil/s back to the ECU for the management of other ECU systems. i.e. A failed feedback circuit may prevent one or more injectors functioning causing a possible misfire and even a no start condition, even though the coil output spark is present. In this case, a no start condition may be diagnosed quickly by cranking the engine after each coil has been individually disconnected at the harness plug. 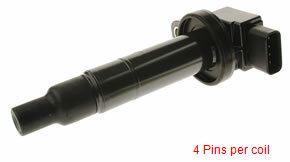 By isolating the faulty ignition coil feedback signal, a possible re-start on the remaining cylinders may be achieved. These coils are generally identified by the extra pins on the connecter plug. Why do coils fail prematurely? A common question but it will depend on the quality of the ignition coil/s fitted. A poor quality ignition coil requires no answer; on the other hand the continuous failure of a quality OE ignition coil requires investigating. Any causes of excessively lean fuel mixtures will result in the reduction of the service life of any ignition coil. Simply, we all know that the ignition coil must work harder to ignite a lean mixture. A multi-coil system with a continuous same cylinder ignition coil failing would need the area around that coil investigated. i.e. A leaking inlet manifold gasket / hose or a leaking EGR valve, are common for premature coil failure. There are of course other unusual causes that have to be investigated individually.